Find out what our experts have to say about Bajaj Avenger Cruise 220! The Bajaj Avenger Cruise 220 is targeted straight at the mile munchers on a tight budget. The long wheelbase, pillion backrest, see-through windshield and tall handlebars make its intentions clear. The lack of rear disc brake would’ve allowed the rider to cruise at highway speeds with more confidence. 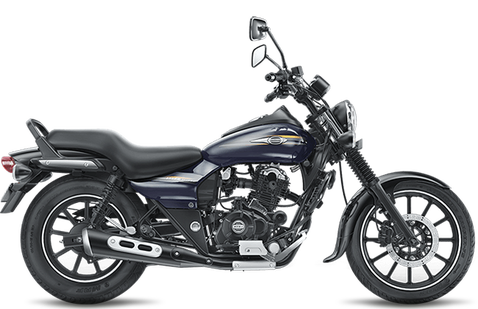 Choose the Bajaj Avenger Cruise 220 which fits your bill! Choose the Bajaj Avenger Cruise 220 which fits the bill of you. Bajaj has ruled the 220cc cruiser segment with the budget-friendly and the maintenance-free Bajaj Avenger 220. With the new Bajaj Avenger Cruise 220, it plans to do the same but with more style and features. Firstly, the Avenger is now split into 2 types - the Bajaj Avenger Cruise 220 and Bajaj Avenger Street 220. As the name suggests, Avenger Cruise 220 is more of a touring bike for the riders who want to travel and tour long distance on their bikes. The new Avenger Cruise 220 comes with a host of new features like the new headlamp with LED DRLs, a taller well-designed windshield, new Avenger logo on the tank, a new digital console and a colour scheme with new graphics. Chrome has been used abundantly at various places that give this cruiser a classy look. The powerful 220cc DTS-i engine gives a top speed of 118Kmph and mileage of 45Kmpl. The Avenger Cruise 220 competes with the mighty Royal Enfield 350 bikes and the new Suzuki Intruder 150 as well. The classy cruiser is now available in two distinguished colours, the smart looking Auburn Black and the classy looking Moon White. The Avenger Cruise 220 2018 is available at a price of Rs 94,963(ex-showroom, Delhi). Bajaj Avenger 220 has been the king of the 220cc cruiser segment for a long time. With the 2018 Avenger Cruise 220, it brings a host of new features with style and elegance. The bike now comes with newly designed headlamps that have LED Daytime Running Lights (DRL) integrated. This takes care of the mandatory Always Headlight On (AHO) and doesn't consume much battery power. It now has a beautifully designed tall windshield which goes well with the headlight and protects the rider from wind blast. To give this bike a classic look, the mirrors, the headlight, the console on the tank, the rear pillion seat rods and the exhaust pipe are all drenched in chrome. Even the new Avenger logo done in chrome with the new graphics gives it an attractive look. The taillight is done well with a new halo effect added to it. The Avenger Cruise 220 comes with cruiser-style handlebars which are really comfortable for long rides and tours. The seat is the same plush and comfortable one which the Avenger Cruise 220 is known for with a backrest added for pillion comfort. Avenger Cruise 220 2018 now sports an all-digital console with a blue backlight. The digital console is very clear and gets a speedometer, two trip meters, a clock, and a service reminder which are very easy to read. Bajaj has been pioneering the DTS-i technology for quite a few years. The same amazing Twin Spark DTS-i technology powers the 220cc, 2 valves, oil-cooled engine of Avenger Cruise 220. This BSIV compliant engine now produces a max power 19.03PS at 8,400rpm and a max torque of 17.5Nm at 7,000 rpm. The power of the engine is harnessed by a 5-speed manual gearbox which is now refined and smooth. The DTS-i technology in the Bajaj Avenger Cruise 220 is powerful enough to attain a top speed of 118kmph and efficient enough to get fuel economy of 45kmpl. The engine is built to perform best in highway conditions but performs well in the city too. The braking duties on the Bajaj Avenger Cruise 220 are governed by 260mm disc brake at the front and 130mm drum brake at the rear. They have a good bite and provides for effective safe braking. The 90/90 tubeless tyre covers the 17-inch classic spoked rims while the broad 130/90 tubeless tyre are wrapped on 15-inch classic spoked rims. The Avenger Cruise 220 2018 now has an anti-friction bush on the telescopic front suspension and coil spring twin shock absorber rear suspension. This tyre and suspension setup gives a very smooth plush ride on the cruiser. With a ground clearance of 169mm, riding the Avenger Cruise 220 on city speed breakers or on rough patches is a piece of cake. With a minimum wheelbase of 1490mm and a strong tubular double cradle frame, it provides amazing stability at high speeds and instills rider confidence. With the advent of the BSIV, the feature of Always Headlight On (AHO) has become mandatory. But the problem with that is it puts a lot of load on the battery and drains it quickly. Manufacturers have been trying to find a solution as to keep the headlight on and not to drain the battery. And ever innovating Bajaj seems to have found the solution to by equipping the Avenger Cruise 220 2018 with LED Daytime Running Lights (DRL) embedded in the headlight itself. This helps to keep the bike safely visible during any light conditions and also puts less power load on the battery. The service reminder on the digital console helps you know when the bike is due for service.